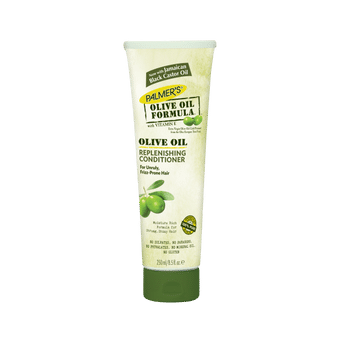 Palmer's Olive Oil Formula Replenishing Conditioner's incredibly rich formula smoothes out frizzy hair, increases moisture levels and softens tight curls. Extra Virgin Olive Oil is combined with Soybean Oil and Keratin Amino Acids to protect the hair from environmental aggressors and hot styling tools. Hair becomes shinier with extra bounce, softer and less frizzy and easier to style. Extra Virgin Olive Oil: contains naturally occurring vitamins and minerals which act as antioxidants protecting hair and skin from damaging free radicals. Explore the entire range of Conditioner available on Nykaa. Shop more Palmer's products here.You can browse through the complete world of Palmer's Conditioner .